Eagle Cliff is a beautiful historic home situated on a stunning oceanfront estate. 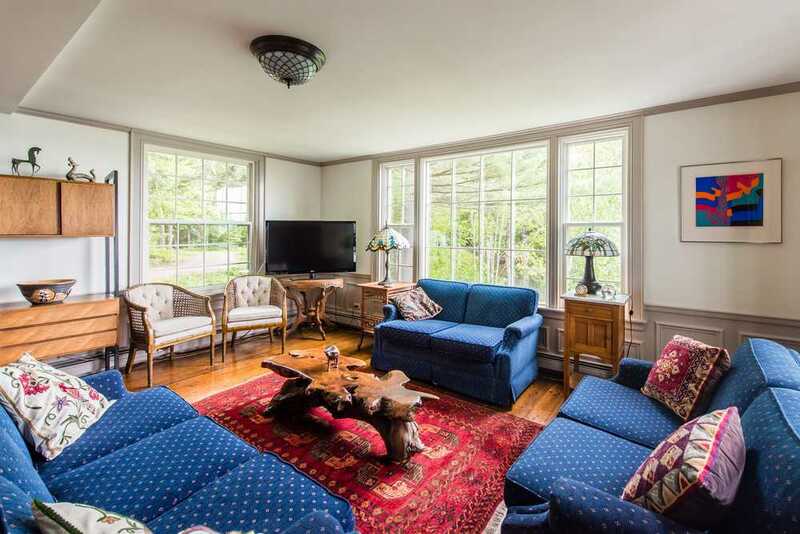 One of the original rusticator "cottages" built before the turn of the century; guests at Eagle Cliff are surrounded by antiques, oriental rugs, and art from around the world, with breathtaking ocean views from every room. A special property sure to please even the most discerning tastes with the perfect blend of quiet and accessibility, historic charm and modern comfort. White pines line the drive up to the main estate. 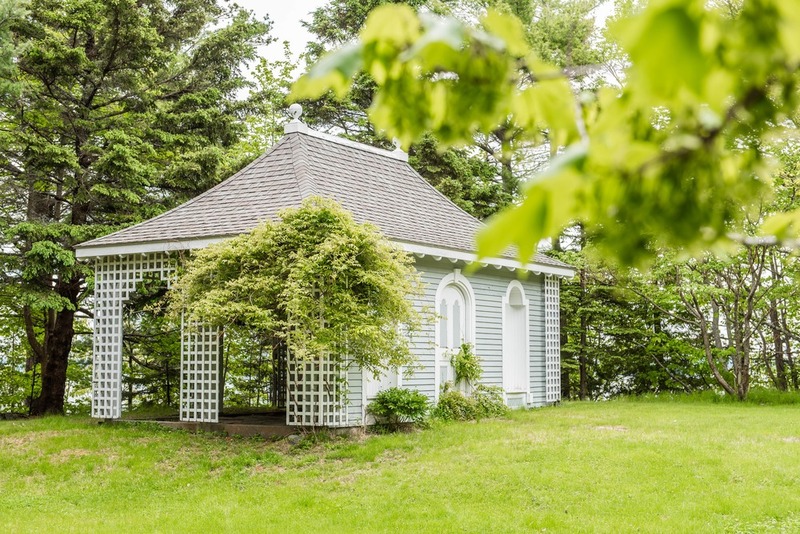 A historic oceanfront estate with stunning views of Acadia National Park. A quiet reading spot on the front porch. Master suite with sitting area. Master suit bathroom with jetted tub, ocean views and hand painted tiles. Upstairs bedroom with double bed and ocean views. Downstairs bedroom with double bed and private full bath. 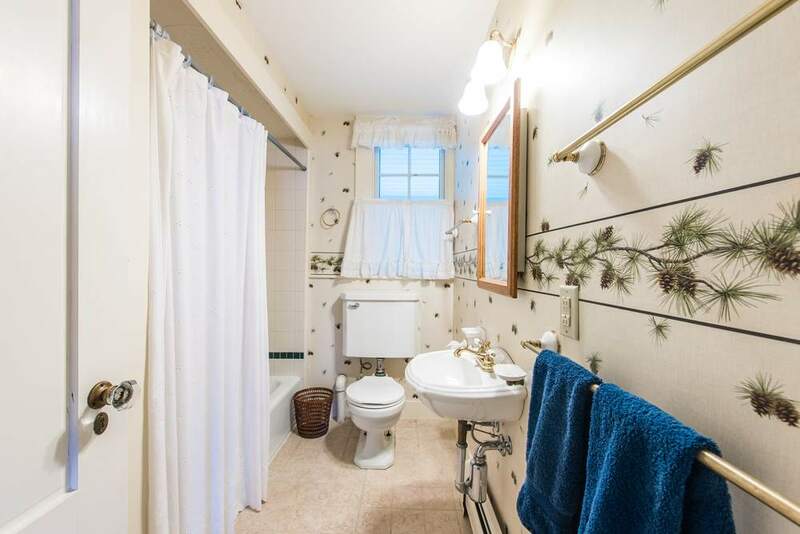 Downstairs bathroom with tub and shower. Living room with ocean views, large TV, and ample seating for the whole gang. Another seating area in the living room. Dining room with stunning ocean views. Large, well equipped kitchen with breakfast table and ocean views. Deer, fox and wild turkeys are often seen from the kitchen window. 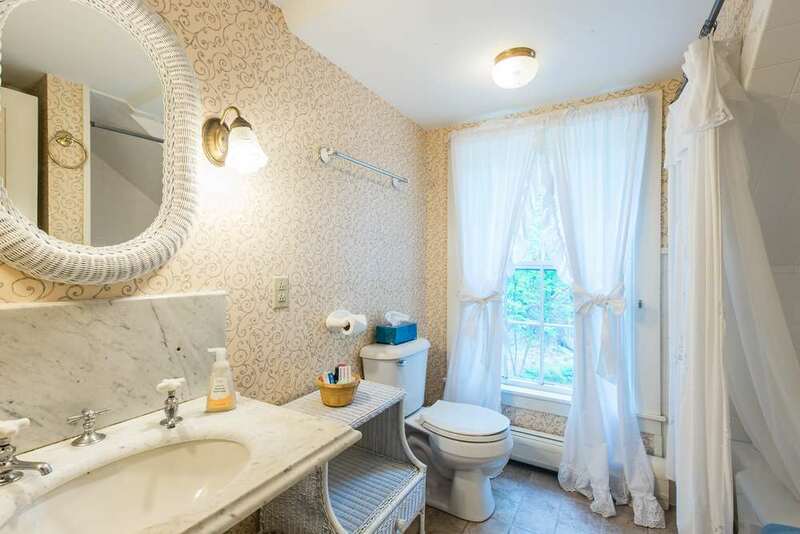 Upstairs bathroom with tub and shower. Oceanside porch with gas grill. From the porch overlooking Frenchman's Bay and the Porcupine Islands. The fog's artistic brush stroke over the Porcupine Islands from the porch. The gazebo where Jen and Adam were married. An old photo showing Eagle Cliff from the water. Compass Cove in Acadia, just a 5 minute walk from Eagle Cliff. There are dozens of hiking trails located just minutes from Eagle Cliff. The town of Bar Harbor is moments away and offers great shopping and restaurants. Take the family to Sand Beach for the day, located less than 5 miles from Eagle Cliff. Smith Family Farm's offers organic, raw milk and their farm is only a 10 minute drive from Eagle Cliff. Located at the end of a small private road through Acadia National Park, Eagle Cliff is only one mile from Bar Harbor where you can access a free shuttle bus that travels around greater Mount Desert Island and through Acadia National Park. 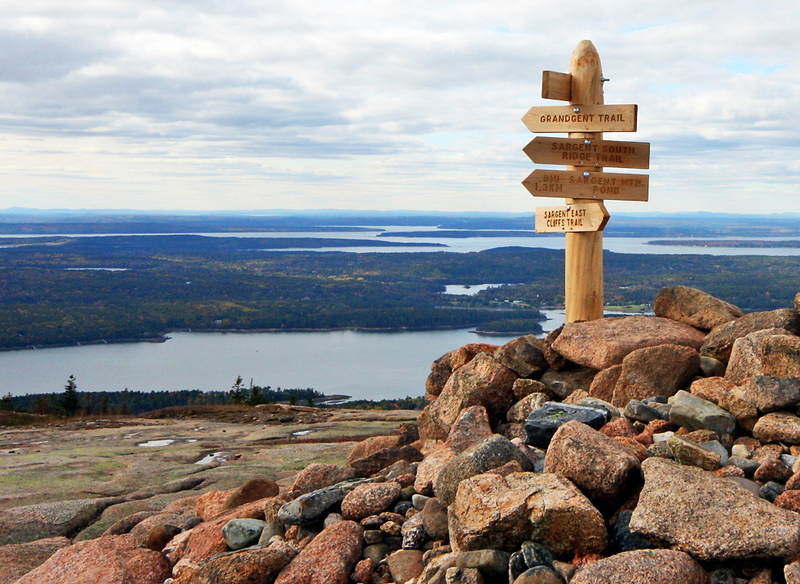 The main auto entrance to Acadia National Park is only two miles away where you can drive or bike the famous Park Loop Rd and all its attractions. There is a separate Guest House on the property that can also be rented allowing for additional occupancy and privacy. Downstairs, the large living room, formal dining room, and kitchen, equipped for entertaining, all overlook Frenchman Bay and the Porcupine Islands. A bedroom with a double bed and private bathroom, and a powder room located near the kitchen and living room round out the ground floor. Upstairs, the large oceanside master suite is complete with deluxe memory foam mattress, private dressing room, and private bathroom with a Jacuzzi bathtub. Another bedroom with a double bed has huge bay windows facing east allowing the occupants to watch the morning sunrise over Frenchman Bay. 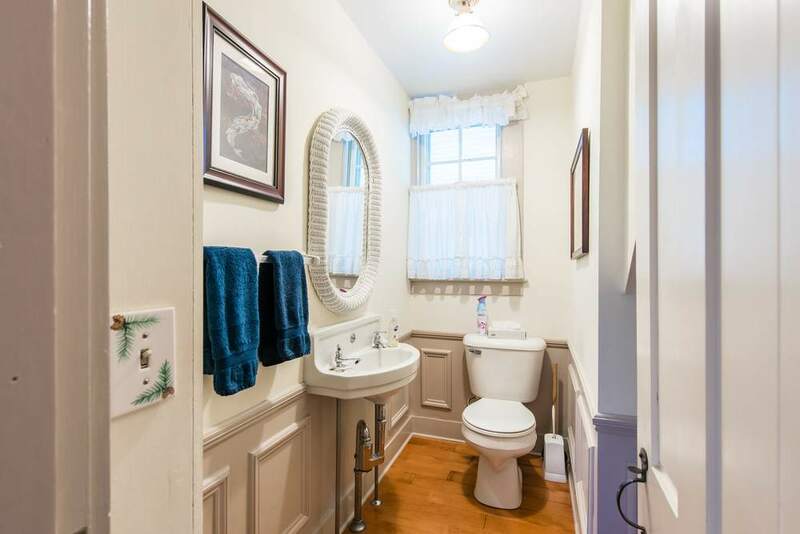 The third upstairs bedroom has two twins, and there is a full bathroom as well. The grounds of the Eagle Cliff estate are just as beautiful as the inside. A stone porch overlooks the ocean with outdoor seating and a gas grill- the perfect place to spend an afternoon reading or having a Barbeque dinner. An entry porch with outdoor seating, a gazebo, gardens, and a large lawn await you. One of the Parks newest trails allows one to literally walk from the house into the 130-mile network of hiking trails, bike to the 45 miles of Carriage Roads, or simply stroll into town for an ice cream cone. Compass Cove, a little known parcel of Acadia National Park, is just a 5-minute walk to a secluded and well-protected sand beach and tide pools. This area is a wonderful place to explore with kids or have a quiet sun-drenched beach all to yourself. The views from almost every window were breathtaking. Enjoying that first cup of coffee on the deck each morning, watching the lobster boats going about their business and listening to the birds call was a slice of heaven and the perfect start to every day. We were enchanted with the wildlife that browsed right outside the kitchen windows. As a family, we enjoyed working on the many jigsaw puzzles that were provided for rainy evenings. A thoroughly delightful week and one we will long remember and cherish. A beautiful, well maintained, classic home aptly named “Eagle Cliff”. It sits on top of a high cliff overlooking the three porcupine islands out in the bay and is just a couple of miles south of Bar Harbor. The house has views from almost every window. We saw several bald eagles and even a juvenile golden eagle while sitting on the lovely stone patio enjoying our morning coffee. Did I mention the deer? They were numerous and close by every day munching on the vegetation. We enjoyed setting up a badminton court for our kids to use (many other games are available) and the deer seemed to like it too. One of our videos shows 5 on the lawn there at one time! We rented Eagle Cliff for a week together with the Guest House which is only a few feet away down the driveway. That enabled us to have a total of 10 comfortably, parents, children and grandchildren. It was a wonderful week that will provide memories for years to come.